UNEXPECTEDLY, The Maharashtra Food and Drugs Administration (FDA) department cancelled the license of Shiv Shakti Medical and General Store at Ulhasnagar. 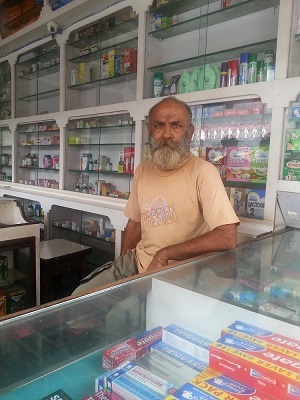 The medical store owner Jamnusingh LL Ailsinghani is a well-known whistleblower in Ulhasnagar who had helped a lot to FDA in taking action on medical stores. 51-year-old Ailsinghani runs Shiv Shakti Medical and General Store for the last 17 years near Goal Maidan, Ulhasnagar-1 in Thane district. He follows all rules and regulations of FDA and health department. On March 27, 2014 two drugs inspectors visited the Ailsinghani’s medical store. They searched entire medical store and left without panchnama. Later they issued show-cause notice to him demanding information on why his license should not be canceled? Without replying to the show-cause notice, Alisinghani, in- turn wrote a letter to FDA, demanding them to first clear in search report, that if pharmacist was available on his medical store or not ? And then he would send a reply of the show- cause notice. But FDA did not reply and on July 7, 2014 informed him that his license is being cancelled. Ailsinghani’s son Rohit is a pharmacist. He was available during FDA search. ABI is in possession of FDA report. There is no clarity that why Ailsinghani’s license is being cancelled. One of the reasons was that during search Ailsinghani was speaking loudly and too much. (Wah bad-bad kar raha tha.) Second, he made allegation on FDA officials for being corrupt. Third, Ailsinghani refused to sign on visit (search) book as it’s was in Marathi language. Ailsinghani alleged that FDA officials are hand in gloves with few medical stores owners. He has written more than 1,000 letters across the country to the concerned department about irregularities in medical stores. Even he gave input to FDA officials on, how search or raid on medical stores. “Mahesh Zagade, Commissioner, FDA came from different department. He knew nothing about FDA rules. I told him that how medical store owners violates rule and regulation,” said Ailsinghani. There may be truth in Ailsinghani’s claims. A right to information (RTI) reply (copy available with ABI) revealed that how figures of license suspension and cancellation increased after Ailsinghsani’s complaints and suggestions. Ailsinghani was writing to FDA, Chief Vigilance Commission (CVC), Health Ministry, Prime Minister of India and President as well as concerned department. He wrote more than 1,000 letters to them. He told that how medical stores in Ulhasnagar and Kalyan are running illegally. How they are selling prohibited medicines without prescriptions. “There are more than 350 medical stores in Ulhasnagar. All of them violate rules and regulations,” said Ailsinghani. After Ailsinghani’s complaints FDA raided more than 150 medical stores in Ulhasnagar and suspended their license. Ailsinghani also received several threat calls but he not stops complaining/informing against medical stores. “My fight will continue against corruption. I will knock the door of court against cancellation of my license,” said Ailsinghani. After repeated attempts Zagade was not available for comments.